Engineered with Bluetooth® technology to create a truly wireless sync solution. 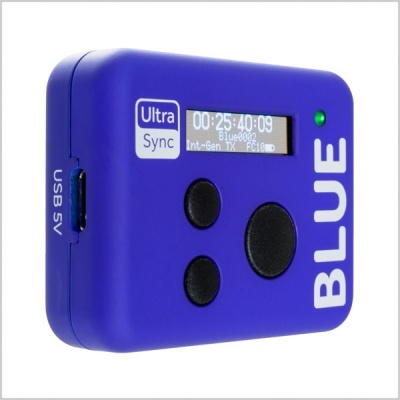 UltraSync BLUE is the first product from Timecode Systems to use Bluetooth® pairing to connect and synchronise compatible recording devices. 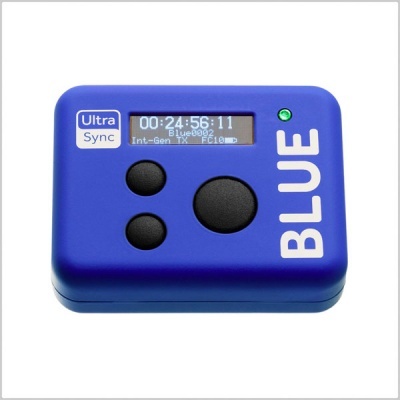 Once connected, timecode is transmitted wirelessly from the UltraSync BLUE directly into the media file of a connected device. There are no cables and no mounting issues, giving more freedom to shoot from creative angles with smaller, more mobile cameras. By removing the restrictions of a wired connection, crews not only gain extra convenience, they also get even more versatility to choose how they sync. Use a single UltraSync BLUE unit to sync up to four recording devices shooting in close range over Bluetooth®. Or alternatively, connect the UltraSync BLUE to a Timecode Systems RF network and sync to other camera and audio recorders using Timecode Systems units on the same channel. It can even sync iPhones, providing an efficient way to integrate iPhone footage into professional shoots. The MAVIS professional camera app and Apogee’s MetaRecorder app (both for iPhone) are fully compatible with UltraSync BLUE. For the first time, there is a way to sync iPhones professionally, with sub-frame accuracy. UltraSync BLUE is currently compatible with the MAVIS professional camera app and Apogee’s MetaRecorder app, both for iPhone. It has the potential to work with any camera or sound recording device with Bluetooth®. Please check timecodesystems.com for updates on integrations with other hardware and apps. UltraSync BLUE uses a patented, timing protocol that delivers unparalleled accuracy for the exchange of timecode over Bluetooth®. It offers the power of professional timecode sync in a compact, wireless product that’s small enough to fit in your pocket and affordable enough to be used on any type of production. Timecode is embedded into the media file and automatically recognised by professional NLEs. After first set-up, UltraSync BLUE remembers and automatically recognises your device. For simple shoots: A unique feature Timecode Systems has added to the UltraSync BLUE is the option to use a single unit to sync up to four recording devices shooting in close range (less than 10 metres) over Bluetooth® . When shoots aren't straightforward: The UltraSync BLUE is designed to work seamlessly with the rest of the Timecode Systems product range. 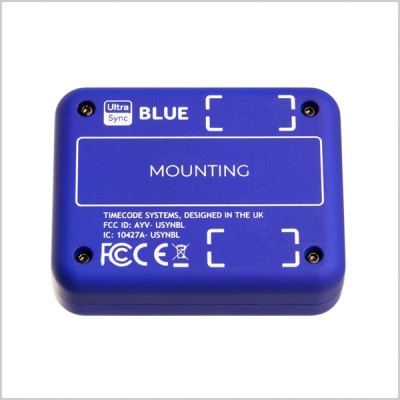 For more complicated shoots and sprawling filming locations, or where a variety of professional equipment is recording, you can connect the UltraSync BLUE to your device over Bluetooth® and then sync over robust, long-range RF to other camera and audio recorders using Timecode Systems units. Sync for iPhones: UltraSync BLUE works in conjunction with the MAVIS pro camera app and Apogee’s MetaRecorder audio recorder app. Simply pair an UltraSync BLUE with an iPhone over Bluetooth®. 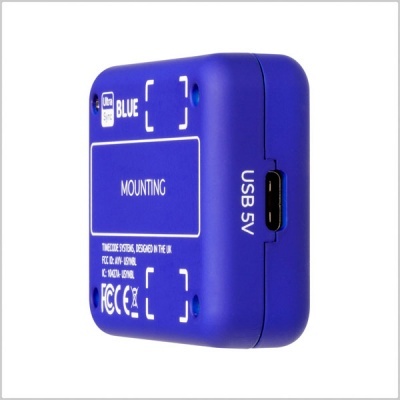 This enables frame-accurate timecode to transmit wirelessly from the UltraSync BLUE to the connected iPhone. This metadata is embedded directly into media files generated from video shot on the MAVIS app or sound captured on MetaRecorder. Zoom Compatibility: UltraSync BLUE will be compatible with a new generation of Zoom recorders. When released, The H3-VR Handy Recorder and F8n MultiTrack Field Recorder will have the ability to receive timecode over Bluetooth from the UltraSync BLUE. Fantastic news for our sound users. Small, lightweight & affordable: UltraSync BLUE is 42mm x 36mm x 17mm, weighs only 36g, features a high resolution blue OLED display. It’s designed to be user-friendly, discreet and unobtrusive to filming. Connect to the BLINK Hub app: Use a :pulse as the timecode master to connect the UltraSync BLUE to the free BLINK Hub app. This unlocks the advanced capability to view, status monitor and control the UltraSync BLUE as part of a Timecode Systems workflow. depending on the mode selected. Via Bluetooth®, output only.